Hortus Camdenensis | Watsonia aletroides (Burm. f.) Ker-Gawl. Watsonia aletroides (Burm. f.) Ker-Gawl. Cormous perennial with sword-shaped leaves and mostly unbranched stems bearing up to 12 tubular orange-red flowers in winter or spring. To 60cm. [RHSE, CECB]. 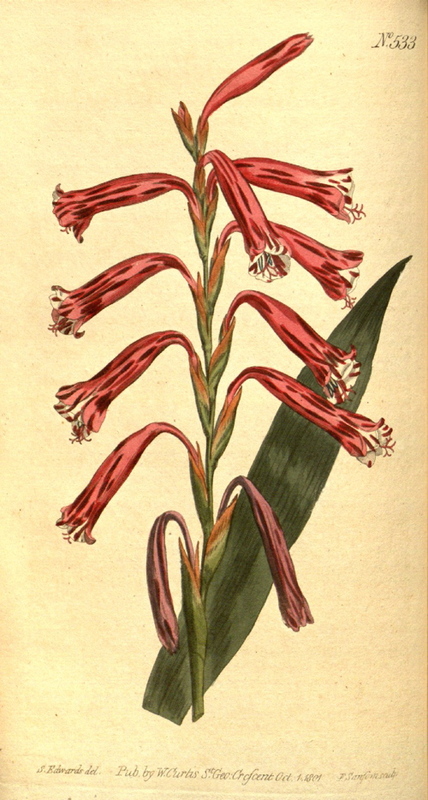 ‘The name of Watsonia was first given by Miller in honour of our friend, the late Sir William Watson and was adopted by Jussieu in that invaluable work his Genera Plantarum, and will be found to form a very natural genus, sufficiently distinct from Antholyza. This very elegant species, which does not appear to have been noticed by Willdenow, is readily distinguished from every other by the distinct form of the corolla, which strongly resembles some species of Aletris, Lachenalia, and Aloe. The alternate segments are interior; the bulb is compressed and tunicated. It is very subject to vary, having in one instance a single scape six to eight inches high, with three or four distant, sometimes one-ranked, flowers; in another, a three or four branched stem two feet high, with a terminal spike of from twenty to thirty closely imbricated distich flowers, and adpressed spikelets in proportion. The same bulb will one year produce pale pink, the next deep crimson, and the following year variegated or striped corollas, as in the figure, always scentless.’ [BM t.533/1801]. Listed in all published catalogues [B.444/1843].